Mayor Caldwell leads today’s Look All Ways press conference at the corner of Ke‘eaumoku and King streets. 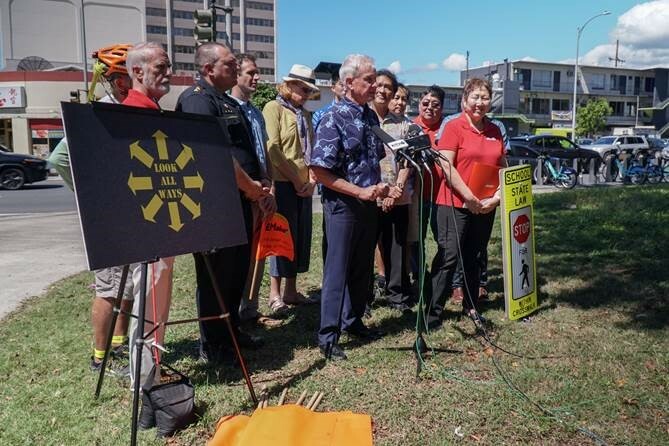 Honolulu – Honolulu Mayor Kirk Caldwell and City Council Chair Emeritus Ron Menor, along with members of the Honolulu Police Department, AARP Hawai‘i, MADD Hawai‘i and the Honolulu Bicycling League, joined together today to announce a package of pedestrian safety measures introduced by the city. The City and County is currently developing an O‘ahu Pedestrian Plan, which is scheduled to be completed in the spring. The plan will define the steps needed to make Honolulu a more walkable, livable, and healthy city. Walking is the oldest and most efficient, affordable, and environmentally-friendly form of transportation; it's how transit riders reach their destinations, how drivers get from the parking lot to the front door, and how cyclists get from the bike rack to a place of business. The O‘ahu Pedestrian Plan will evaluate existing conditions and propose/prioritize pedestrian improvement projects and programs facilitating multimodal travel consistent with the city's Complete Streets Ordinance. The plan will complement the Statewide Pedestrian Master Plan that the State of Hawai‘i Department of Transportation (HDOT) prepared for the state’s highway system in 2013.